Nearly one-third (30.8%) of smartphone consumers accessed social networking sites via mobile browser as of January 2010, up 8.3 percentage points from 22.5% a year earlier, according to comScore. Meanwhile, access to Facebook and Twitter via mobile browser registered triple-digit growth in the past year. 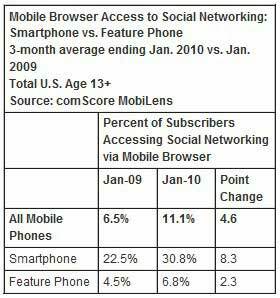 Over one in ten (11.1%) of mobile phone consumers accessed a social networking site via mobile browser as of January 2010, up 4.6 points from a year earlier.